Quoting a 2003 workplace study by COGNA Behavioral Health called""Worried at Work: Mood and Mindset in the American Workplace,"" Stack argues that workers are stressed to epidemic proportions. Building on the platform of the acronym""PRODUCTIVE,"" Stark, who holds an MBA and gives inspirational speeches, introduces 10 quizzes and consecutive chapters based on the productivity factors: preparation, reduction, order, discipline, unease, concentration, time mastery, information and equilibrium. By combining fill-in-the-blanks charts and lists with her established techniques, Stark presents a method of organization that can be individualized and effective. Thankfully, her didactic tendencies are muffled by her straightforward style and effort to target each individual organizer. 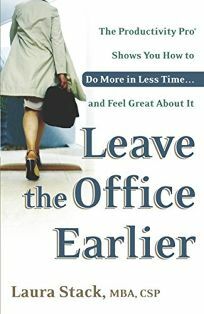 Her book is thorough, and although the payoff is a good one, readers who are truly swamped may not have the time to complete all of the exercises.